Our team is constantly making improvements to our software platforms. From fixing bugs to adding enhancements, our engineers are working behind the scenes to make the software you use on a daily basis more convenient and powerful. Release notes are our way of sharing these updates with customers, making it easy for everyone to know about the latest and greatest features in FRONTSTEPS. You may have heard about our new #YouAskedWeListened initiative which is helping us focus on utilizing customer feedback to make our overall platform easier to use. The majority of enhancements in this month’s release were related to usability, so we’re looking forward to hearing your feedback! 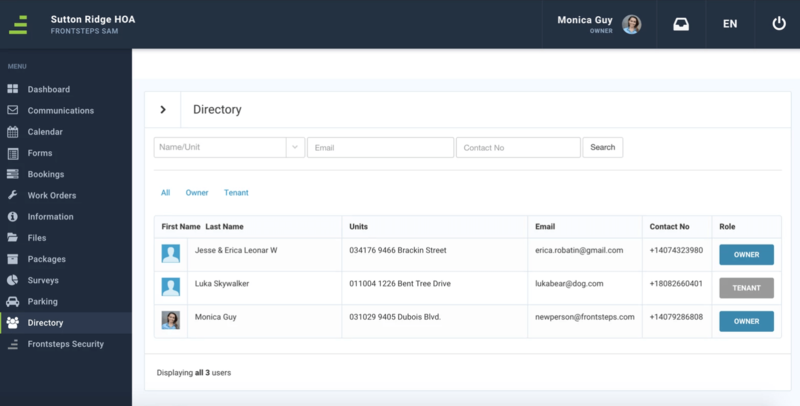 We are excited to announce the launch of our form builder tool, which we’re referring to as eForms. We hosted a webinar a few months back introducing this new tool and invited customers to join a beta test. During the beta, we were able to collect excellent feedback that was used to make necessary enhancements before setting this feature live. This feedback led us to add the ability to choose your audience for the form (who in the community can fill it out), as well as create a URL for public forms that can be shared on your website. Please note that this tool is only available to FRONTSTEPS Connect customers. If you’re interested in learning more about the features offered in Connect, please reach out to our team at sales@frontsteps.com. We announced this update earlier in the month, but since it's a big one, we're mentioning again. The previous layout for +New button was clunky and somewhat confusing. On every page of the platform you could add anything, rather than simply adding a new item specific to the page you were on. Here’s what it looked like. We implemented a new button that’s specific to the page you're on. In the example below, the user is on the Forum page, so the button simply says, “+Forum Discussion.” This will make it easier for users to add the item they need to, rather than scrolling through a long list to find what they’re looking for. We have made changes to both Parking Lots and Storage Lockers. First up, we changed the naming conventions of these items to Parking Spaces and Storage Spaces. Next up, we created the ability for Managers to add, edit, and delete both Storage Spaces and Parking Lots, meaning they will no longer have to reach out to our Support team to complete this simple task. In an effort to clean up the directory and improve the overall user experience for Managers, we moved the Registration Status section from the Users/Units tab to the dashboard. We also cleaned up this section by removing unnecessary fields and providing more information on what each label means. Access Requests = Unverified. These are the people that went to the "sign up" page and want access to that community's FRONTSTEPS Account. Pending Invites: These are all the community members that have gotten an invitation to join, but have not accepted or signed in. Offline: These are all the community members that don't have an email or internet access. Registered = Verified. This is the total count of all verified community members. We launched a community directory for residents. To protect privacy, Managers will need to turn on the directory, and have the ability to do so for both owners and tenants. 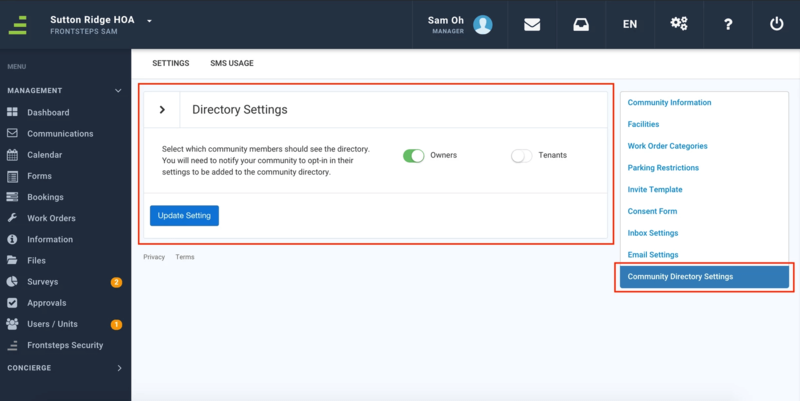 When a Manager decides to turn on the directory, both owners and tenants will need to manually opt-in to have their information displayed in the directory (if they do not opt-in, their information will not be displayed). Managers also have the ability to manually opt-in residents. Speaking of opting-in, we made it even easier for residents to to opt-in to receiving text messages from your community. As they are setting up their profile, they can simply check the text opt-in box towards the bottom of the form. Teaser: New Navigation Changes are Coming! Through user testing and customer feedback, our Product team has been working hard to help make the software easier to navigate. The goal is to help you find the features you’re looking for quickly and easily. Stay tuned for more information regarding exciting navigation updates that will be released in the very near future. We love your feedback and are using it to make our product even better. Be sure to visit our digital Productboard to share your feedback, vote on new features, and see which product enhancements are currently in the pipeline!